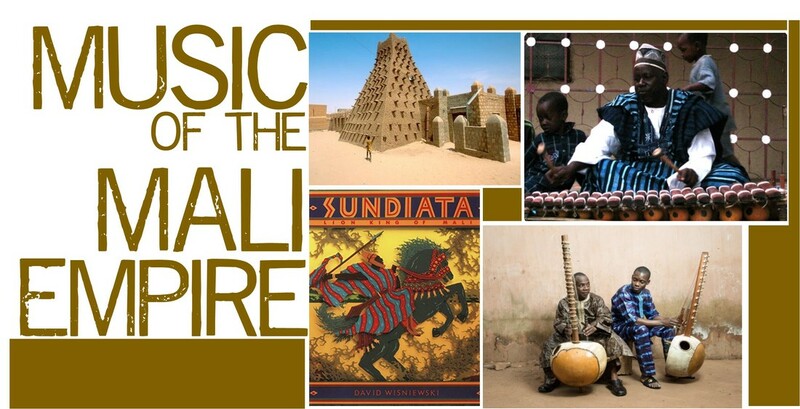 The Music of the Empire of Mali curriculum takes students on a historical exploration of the Mali Empire (1235 – 1600 AD) and the vibrant music traditions that remain alive in contemporary West African countries that were a part of the empire. The legacy of Kunta Kinte, of Alex Hailey’s Roots, serves as an entry point for African American students to learn the legacy of Old Mali, which stretched from Mauritania, Senegal and The Gambia to Niger and southward into northern Ghana. Students study the Griot or Jali music traditions and instruments of these areas and learn to perform songs in Bambara and other Manding languages. Students also engage in children’s literature to learn the history connected to two legendary rulers of the Mali Empire, Sundiata Keita and Mansa Kankan Musa. The curriculum includes djembe drumming, balafon arrangements that are adapted for Orff instruments, creative writing, children’s books, videos and a workbook that gives students a hands on exploration of cultures from The Gambia, Senegal and Mali.